Everything you need to know about Magnetic Grill – The propitious solution from the house of Galaxy Sivtek! Galaxy Sivtek > Blogs > Everything you need to know about Magnetic Grill – The propitious solution from the house of Galaxy Sivtek! Galaxy Sivtek believes the goodwill of any business depends upon the quality they deliver! As we do believe in quality, we feel its important to manufacture technology that can help other industries to deliver quality. Enlightening you all to the range of magnetic grills from the house of Galaxy Sivtek. 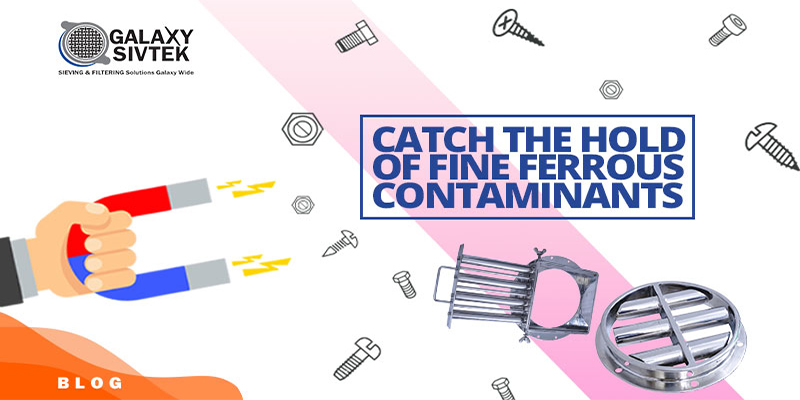 Many times, during the production & manufacturing of pharmaceutical products, food & beverages products, detergent powder, etc chances of contamination of ferrous iron particles is high. Fine ferrous contaminants occur as material passes through various stages where the chances of iron contamination is possible, for instance when any production material is passed through conveyer belt, bolts or any small MS (Mild Steel) part can get into material or if process has blading stage, chances of small part of blades getting mixed with material is high; so to catch hold of such ferrous iron particles, we started manufacturing of an extra ordinary add on for sieving & filtering machines, which we call it Range of Magnetic Separators. Listed below are the few features along with benefits of Magnetic Grills. It is made by high-quality Stainless Steel with best surface polish. We manufacture & supply magnetic grills in SS316 & SS304 grades. The gauss power of the magnets ranges between 10000 – 10500. It is available in two shapes with different size, power range & diameters: Magnetic Grill – Round & Square/rectangle. Round magnetic grill is fixed which is usually installed at outlets & inlets; while Square is drawer type of magnet which can be removed for cleaning & is usually installed below the hopper. It can be placed with any sieving & filtering machines regardless of companies it has been manufactured by. It can be installed below the hoppers, at inlet or outlet depending upon the nature of the material to be sieved. It’s fully customized as per the requirement of client. Easy to install & remove, also can be clean manually with no operating & maintenance cost. It is suitable for dry powder, slurries & even liquid materials. The Magnetic grills which we provide are as per US FDA & other major guidelines. Now removing tramp iron or fine ferrous contaminants from the process material is quite easy.